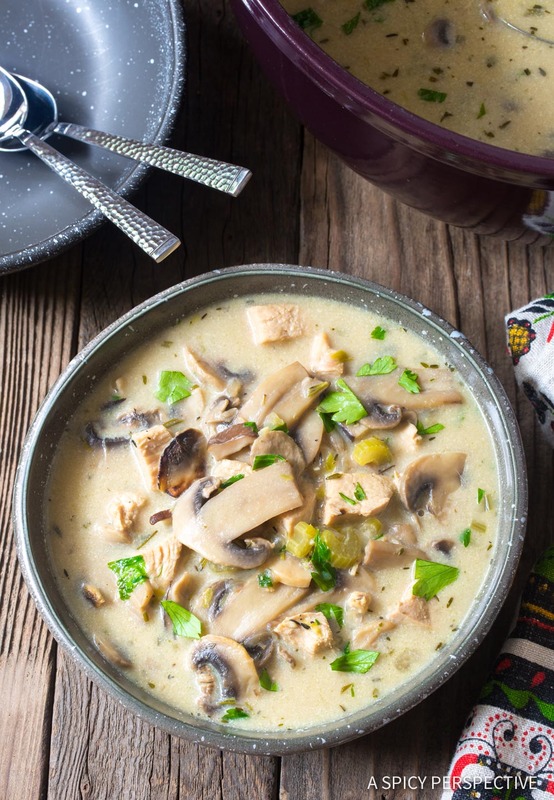 Low Carb Creamy Chicken Mushroom Soup – A ketogenic recipe with hearty chunks of protein and a silky broth. When you think of autumn flavors, what comes to mind? Apples? Pumpkins? To me, mushrooms are the purest flavor of fall. 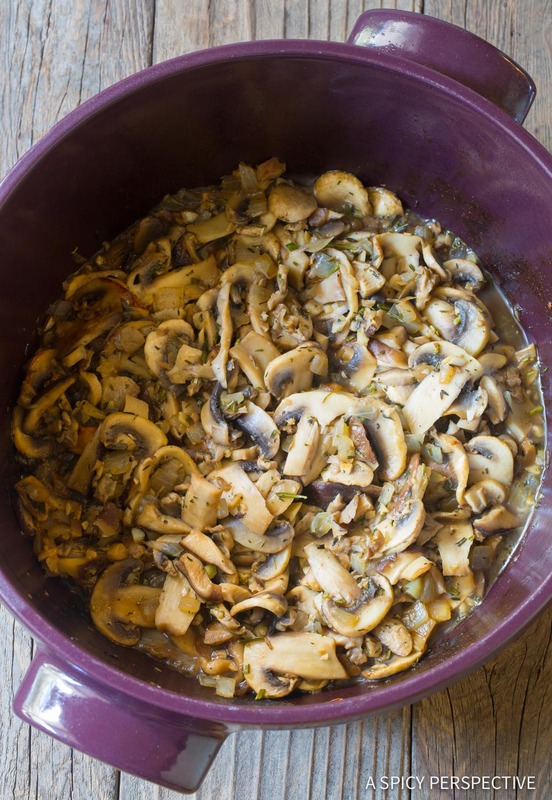 Recipes that are heavy on mushrooms offer an intense rustic depth that cannot be replicated by any other ingredient. In fact, quite often when I taste a dish and feel like it’s missing something, it’s that underlying umami essence we find so abundantly in mushrooms. 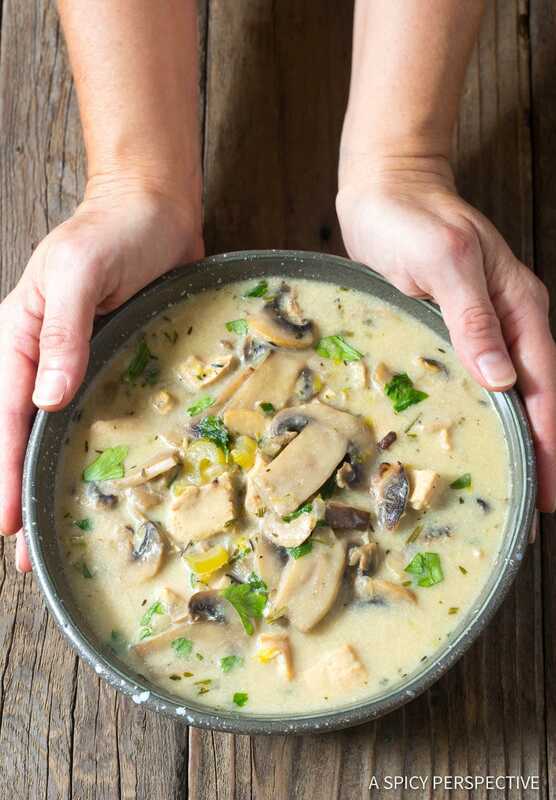 Today’s recipe, Low Carb Creamy Chicken Mushroom Soup, is chock-full of umami goodness! It’s creamy, chunky, robust, and subtle… All in the same bowl. Plus, it’s packed with protein and very low it carbs. 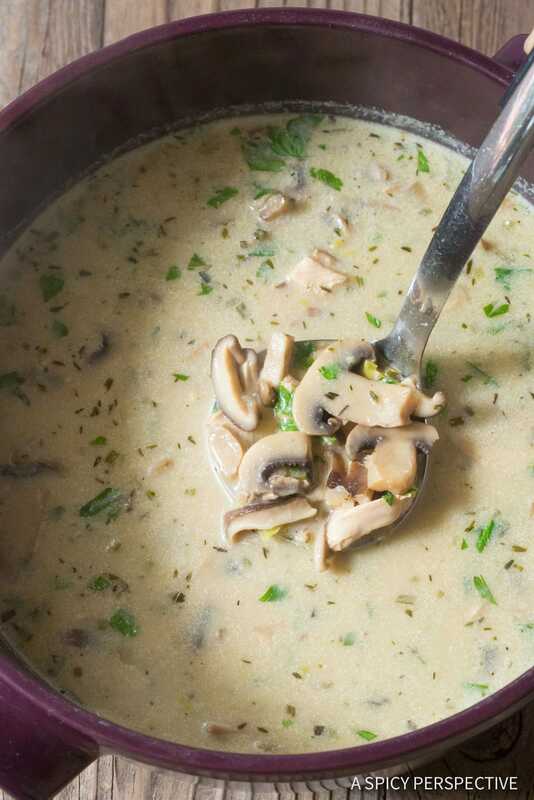 After sautéing the mushrooms, then simmering them in the broth, a generous splash of heavy cream gives the mushroom and chicken soup a luxurious finish. The cream also provides enough fat to balance the Low Carb Creamy Chicken Mushroom Soup’s macros so it’s perfect for a ketogenic diet. When I make chicken soup, I like to poach whole chicken breasts right in the broth. This not only gives and chicken broth a richer flavor, it protects the chicken from overcooking. 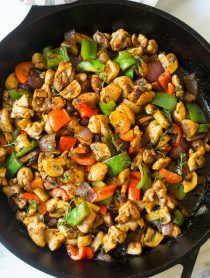 Cooked chicken is easier, than raw chicken, to cut into chunks. So you simply pull the cooked breasts out of the soup with tongs. Chop them. Then throw the chicken chunks back into the soup. 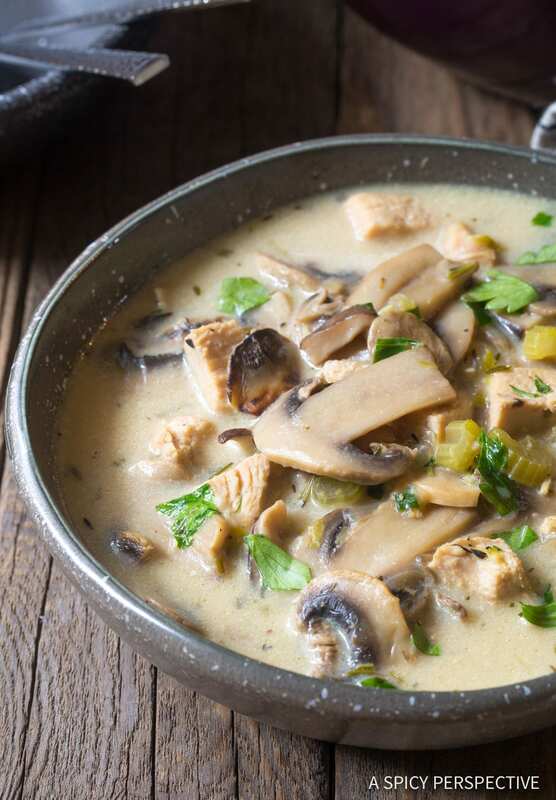 Although this Low Carb Creamy Chicken Mushroom Soup recipe is not dairy free, it still tastes delightful if you leave the dairy out. 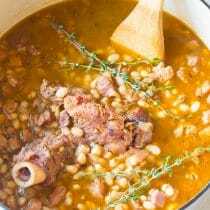 Of course the broth is thinner, and the soup is no longer “ketogenic.” Yet it is still low carb, high protein, and tantalizing to the tastebuds! 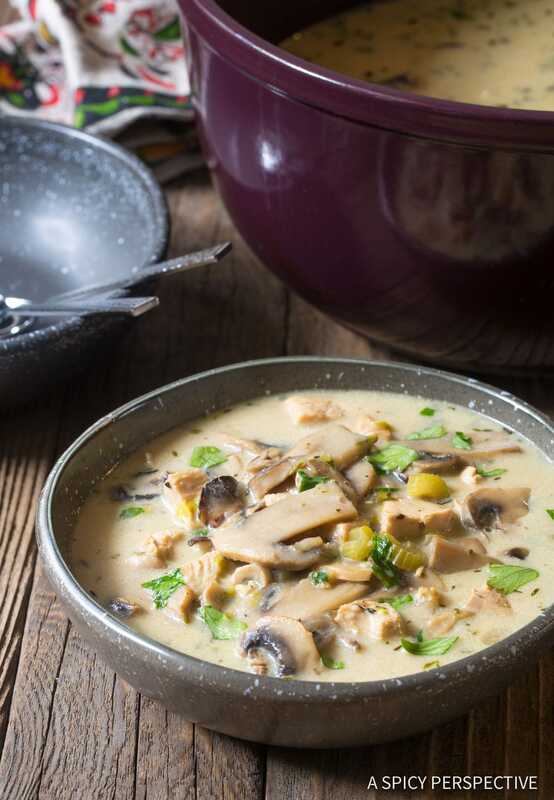 Low Carb Creamy Chicken Mushroom Soup - A luxurious ketogenic chicken soup recipes with a rich silky mushroom broth, and hearty chunks of chicken and mushrooms. Add the butter to a large 6-8 quart soup pot and set over medium heat. Once melted add the onions, celery, and garlic. Sauté for 2-3 minutes, then add in the mushrooms, rosemary, and thyme. Sauté until the mushrooms soften and cook down. Deglaze the pot with dry sherry. Then add in the whole chicken breasts, chicken broth, 1 teaspoon salt, and 1/4 teaspoon black pepper. Bring to a boil. Then lower the heat and simmer for 15 minutes, or until the chicken breasts have cooked though. 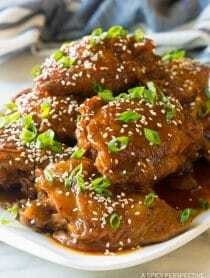 When the chicken is fully cooked, remove the breasts with tongs, and chop into bite-size pieces. Whisk the cornstarch into the heavy cream, making sure there are no clumps. Then whisk the heavy cream into the soup pot and allow it to simmer and thicken. Stir the chopped chicken back into the soup and add the parsley. Taste, then salt and pepper as needed. This looks so good! Does it freeze well? Cooked chicken is easier, than raw chicken, to cut into chunks. So simply pull the cooked breasts out of the soup with tongs. Chop them. Then throw the chicken chunks back into the soup. This is the correct way to do it. Thanks for sharing. 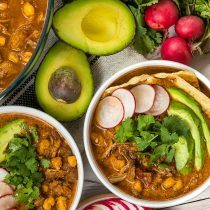 Not only are your recipes simple to make, and absolutely delicious, but your food photography is among the best I’ve seen! Mind me asking where you learned this part? Can this be made in a crock pot? If so what changes. Yes, absolutely! Just be sure to sauté all the vegetables on the stovetop before placing in the slow cooker. Slow cook on low for 4-6 hours. Then add the cream mixture and cook another 30-60 minutes to thicken. What can be used instead of sherry? I do want to keep it keto/low carb. You can just omit it altogether. However, it does bring a lot to the table. Super easy to make and turned out great. All I had on hand was a dry pinot noir rosé but it really did the trick. That squeeze of lemon juice really wakes the whole thing up, so in my notes I’ve crossed out the word ‘optional’. Also, thank you for giving me the courage to spend more time cooking down the mushrooms to brown them well. Fully worth it, and again, I’ve learned something new. I input the recipe into a nutrition calculator and got 10 carbs…. not 4, just a heads up for those who need to count carbs. What app did you use? We check our nutritional values with two apps, but there’s always room for error. I made this soup today with leftover chicken. It was great I would make it again. I added about 1/2 tsp red pepper flakes to kick it up a notch. We ate one bowl then I added about 1 cup of cream cheese to the boiling soup it worked too, it didn’t make that much difference so we would leave it out. I might add some spinach when I heat it up tomorrow. Hi, is there a substitute for the sherry I could use? The sherry does a LOT for the flavor, but is not absolutely necessary. You can find small bottles of cooking sherry at the grocery store. If you want to take it out, add in extra broth instead. Hi! If I was going to use arrowroot powder, would I still use 1 tablespoon of it? Thanks! This was SO good!! Followed recipe to a T, however I topped with lemon zest and reminded me a bit of Greek lemon chicken soup. and also garnished with fresh grated parmasean cheese! Yum! Made this today as a cold front blew through, I am a mushroom freak. It is delicious! Thanks so much for a great recipe. This soup is delicious! It will definitely become part of my “favorites” lineup. I wouldn’t change a thing! Definitely use a mixture of mushrooms. Cornstarch is a no no only 4 carbs are you sure? 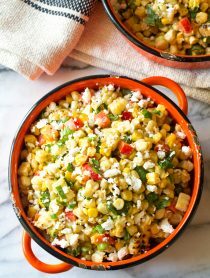 The whole recipe only calls for 1 tbsp of cornstarch, which is 7g. Not much per serving and it thickens the soup perfectly. 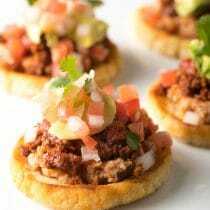 That alone should not kick you out of ketosis, should it? Can this recipe be adapted to use goat milk instead of heavy cream? My sister-in-law would probably love it, but has recently been going “cow” dairy free, and using goat milk instead. Also, can this soup be frozen? Such a large amount would be way too much and end up going to waste, so being able to freeze it would be fabulous. I’m not such a mushroom fan, so I’m not very knowledgeable about them. Wow, I’ve never made this recipe with goat’s milk, but I think it will work. It should freeze well, just make sure to rewarm it at room temperature before reheating. However, you could also just half the recipe. 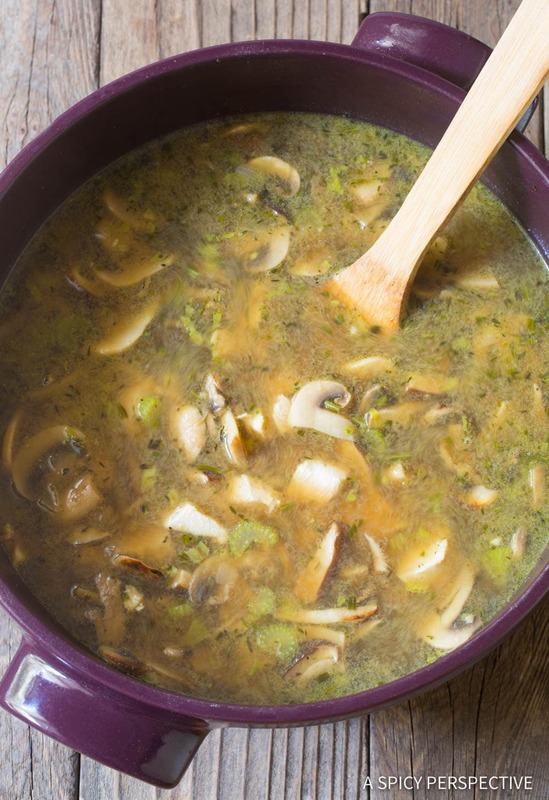 a very nice recipe, thank you, low carb better and low carb soup better even than that! 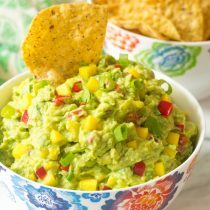 Oh, I fell in love with this recipe in the photo! I am already introducing the delight of my relatives when I cook this delicacy for them! Thanks for the recipe! You are best!! !